Product prices and availability are accurate as of 2019-04-08 04:50:29 EDT and are subject to change. Any price and availability information displayed on http://www.amazon.com/ at the time of purchase will apply to the purchase of this product. 3150 Connection Type: CC Connections Features: -Pressure balancing valve design with integral check stops, 1/2'' IPS connections.-Volume control lets you adjust the amount of water that flows from your tub or shower from a gentle stream to full force.-Supplied with adjustable temperature limit stop.-Knob style handle, Pull-on push-off design.-Temperature operates through an 180 arc of handle travel (full cold to full hot).-Adjustable temperature limit stop to control maximum hot water temperature.-Pressure balancing mechanism maintains selected discharge temperature to +/- 2 degrees Fahrenheit.-Cartridge: 1225 design, nonmetallic/nonferrous and stainless steel materials, accommodates back to back installations.-Third party certified by CSA to meet CSA B-125, ASME A112.18.1M and all applicable requirements referenced therein.-For additional dimensions see the Product Specifications PDF below. 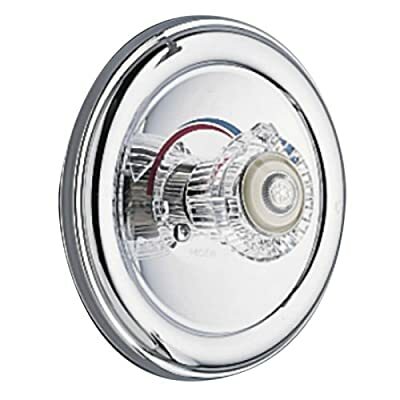 Construction: -Metal construction with a chrome plated finish. Dimensions: -For use with a 5.5'' wall opening. Warranty: -Lifetime limited warranty against leaks, drips and finish defects to the original consumer purchaser.-5 year warranty if used in commercial installations.